After having completed high schooling from “St. Xavier’s Boys Academy”, he acquired his Law Degree post his graduation in Bachelor’s in Commerce. EKTA world, a real estate firm has grown from strength to strength in last 30 years. From a humble beginning as a Real Estate Consultant to a stalwart in the today’s Real estate fraternity, Ashok has achieved it all. He has been instrumental in the growth of the organization and has gone beyond the conventional and given structures that personify finesse. Ashok has been the driving force behind the metamorphosis the organization has had in the last 30 years. Now christened, EKTA world, the endeavor continues to give the city structures that one can be proud of. Each project is a landmark in its own right and is a memorable part of the city skyline; EKTA world has not just built remarkable structures but has also built a reputation that is as solid. Ashok has significantly contributed to the restructuring and has pioneered concepts in the Real Estate fraternity like Villas in the Sky etc. Ashok Mohanani is associated with the Lions Club of International. And currently holds the Title of “Senator of CSR”. Rural Development & Village Adoption has been on the forefront of the initiatives undertaken and Ashok has adopted over 6 villages within the periphery of Mumbai and has taken upon himself to ensure that they are equipped with basic necessities and sanitation for a habitual living. Sharddha Rehabilitation centre is yet another endeavor of Ashok to bring a smile in the life’s of the lesser fortunate. He has been a founder member and trustee of Shraddha Rehabilitation centre, set up in 1988, Shraddha is a humane experiment, perhaps the only one of its kind in India, providing treatment, custodial care and rehabilitation to a neglected group of mentally - ill roadside destitute and reuniting them with their lost families. His colossal passion for social service gave him the opportunity to work with the legendary Mr. Baba Amte and Dr. Prakash Amte towards the rehabilitation of the mentally ill roadside destitute. The Brahma Kumaris World Spiritual University in Mt. Abu, India, is an international non–governmental organization (NGO) in general consultative status with the Economic and Social Council of the United Nations and in consultative status with UNICEF. The Brahma Kumaris support the UN Millennium Development Goals through a wide range of programs promoting education; gender equality and empowerment of women; mental, physical, and spiritual health and well-being; and environmental sustainability and Mr. Mohanani actively pursues these programs along with being on a Spiritual journey. Famed for its thoughtful planning, marvelous architecture and excellent execution, the group’s success stories include Lake Homes, EKTA meadows, EKTA terraces, Lake Superior, EKTA Empress, Ecstasy I & II, & Eminente. These are few of the landmark residences the group has built over the years. The company has grown from strength to strength; the group has built choicest residential complexes in the western suburbs between Bandra & Dahisar in Mumbai, the up market NIBM road at Pune and a global residential township near the heritage site of Pandav Leni at Nashik. Currently on the Managing Committee as the Vice President of NAREDCO WEST – Maharashtra (National Real Estate Development Council). NAREDCO is a real estate development body under the aegis of Ministry of Housing & Urban Poverty Alleviation, Government of India. He continues to be an active member of Lions’ Club International and have been a part of the organization for the last 16 years; currently the District Chairperson for the Rural Development portfolio. Apart from this, he is the trustee and founder member of Sharddha Rehabilitation Centre that works towards the upliftment of road side destitute, schizophrenics etc. It’s time to breathe a sigh of relief for the developers across the city with the onset of the festive season, there is buoyancy in the market. Fence sitters are making their home buying decision. 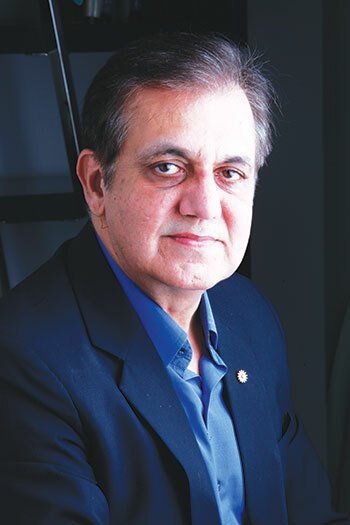 Mr. Ashok Mohanani , Chairman- EKTA World quotes that people now feel confident to invest in Real Estate post RERA and as GST policies have settled. The recent ‘Ready to Move’ segment has seen more demand and there are many developers offering great benefits to customers, the future does seem promising with RERA for the developers and customers alike.